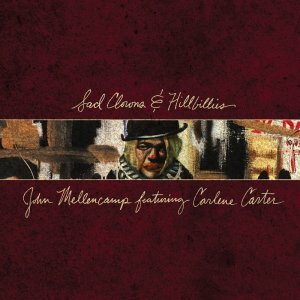 On April 28th, Heartland rocker John Mellencamp will release his 23rd full-length album, Sad Clowns & Hillbillies featuring Carlene Carter, the daughter of June Carter Cash and stepdaughter of Johnny Cash, on Republic Records. Sad Clowns & Hillbillies returns Mellencamp to the musical eclecticism that is, itself, a reflection of his wide-ranging musings on life. John Mellencamp is an authentic voice of American music and master storyteller with a commitment to creating traditional rock & roll, bittersweet songs of happiness and melancholia, and fervent political dissent. His passions and experiences resonate beautifully in this showcase of his music. Sad Clowns & Hillbillies is produced by John Mellencamp. Mellencamp s new single is Grandview featuring Country music star Martina McBride. He released the track, Easy Target in January as a continuation of Mellencamp s journey to convey the truth through this passionate and plain-spoken song. The video's release occurred on the eve of the inauguration. The song focuses on the Black Lives Matter movement as well as gun violence in America. Fans who pre-order Sad Clowns & Hillbillies will get an instant download of Grandview and Easy Target.